In order for any solar particle to reach the Earth, it must first pass through the Earth's magnetic field. 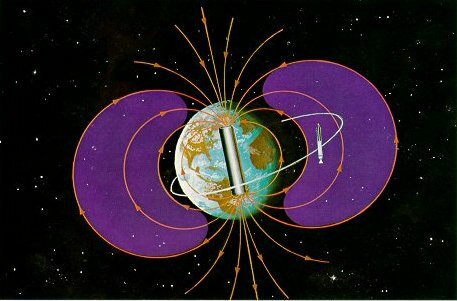 Before the solar wind was discovered, the Earth's field was thought to be symmetrical, resembling that of a huge bar magnet, fading off indefinitely into space. However, we now know that the solar wind shapes the outer regions of the Earth's magnetic field, and that the field is sharply bounded. Outside the boundary, space is dominated by the solar wind and the interplanetary magnetic field. Inside the boundary is the region or magnetosphere dominated by the Earth's magnetic field. The measurements from many space missions have been combined to reveal that the Earth's magnetosphere is blown out by the solar wind into a teardrop shape. The head of the drop extends only about 10 Earth radii, or about 65,000 kilometers (40,000 miles) "upwind" toward the Sun. The tail of the drop stretches away in the direction opposite the Sun, actually reaching beyond the Moon's orbit. This long magnetotail extends more than 600,000 kilometers (370,000 miles) from the Earth. At the boundary of the magnetosphere, there is a constant struggle between the magnetic field of the Earth and the forces of the Sun. Buffeted by fluctuations in the velocity and density of the solar wind, the magnetosphere's size and shape are continuously changing. At the point where the solar wind strikes the magnetosphere, a shock wave forms, analogous to the sonic boom that precedes a supersonic airplane. Inside the boundary with the solar wind, the magnetosphere remains an active region. It contains two belts of very energetic charged atomic particles that are trapped in the Earth's magnetic field hundreds of miles above the atmosphere. These belts were discovered by Professor James Van Allen of the University of Iowa and his colleagues in 1958, using simple radiation detectors carried by Explorer 1, the first U.S. satellite. It once was thought that the Earth was surrounded by near-empty space, in which the Earth's magneticfield would trace a pattern resembling that of a bar magnet (orange lines). 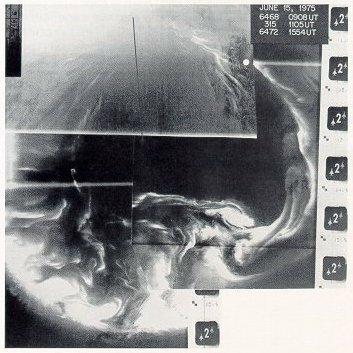 However, the first American spacecraft, Explorer 1 (shown here), discovered a belt of energetic particles trapped in thefield and streaming back and forth above the Earth. It was the first of two such zones, the Van Allen belts, to be found. Studies by several satellites and spaceprobes have now mapped much of the region of magnetic field structures and streams of trapped radiation particles around the Earth, the magnetosphere. Pie solar wind, streaming outfrom the Sun, shapes the magnetosphere into a teardrop, with a long magnetotail stretching out opposite the Sun. The structure of the Earth's magnetosphere also controls the behavior of aurorae, seen in our night skies. Pre-Space Age textbooks stated that aurorae are produced by protons which are emitted from the Sun and reach the Earth's upper atmosphere through gaps that exist in the Earth's magnetic field at the north and south magnetic poles. According to the theory, these protons strike oxygen atoms in the atmosphere, and the collisions cause the glow which we call the Northern Lights. This view has changed in the Space Age. The data collected by many spacecraft showed that the situation is more complicated. Particles from both the solar wind and from the Earth's atmosphere apparently are stored in the magnetotail. From there, they periodically are violently ejected into the northern and southern polar regions of the atmosphere along the Earth's magnetic field and are accelerated to high speeds by a process not yet fully explained. The magnetotail is in effect a reservoir of particles that is periodically refilled. When the Sun is active during maximum sunspot years, this process is especially intense and frequent, and the aurorae are brighter and move closer to the equator. Northern lights, a gift from the Sun. This brilliant green display of the aurora borealis, photographed from Fairbanks, Alaska, resembles a huge curtain with a circular fold. Aurorae, stimulated by disturbances on the Sun, are atmospheric phenomena which also take the shape of rays, streaked clouds, and a "starburst" or crown form, which corresponds to a curtain viewed from directly below. Colors range from white through green, blue, and red. Space probes have discovered that three other planets besides the Earth have magnetic fields strong enough to form magnetospheres around them. The magnetospheres of these planets, tiny Mercury, giant Jupiter, and ringed Saturn, are as different as the planets themselves. Mercury's magnetosphere is much smaller and weaker than the Earth's, while Jupiter's very strong magnetic field has trapped particles in a violently active magnetosphere so large that, if visible from Earth, it would appear as big as the full Moon. Saturn's magnetosphere is intermediate between those of the Earth and Jupiter. Comparative studies of the magnetic fields and magnetospheres of the planets should help us interpret the origin of the Earth's magnetosphere and its as sociated phenomena, and to understand why some planets apparently do not generate their own magnetic fields. Just as there is a sharp boundary between the Earth's magnetosphere and the solar wind, there must be a limit to the much larger region filled by the solar wind and the interplane tary magnetic field. 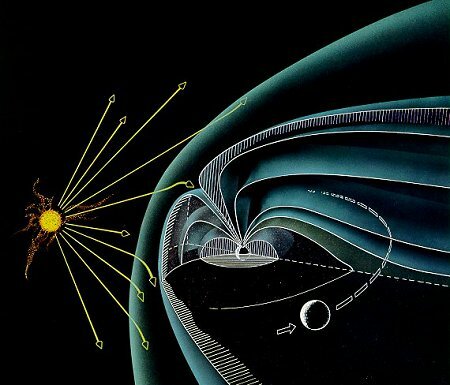 This region, called the heliosphere since it is dominated by particles and fields that originate in the Sun, has "upstream" and "downstream" directions just as the Earth's magnetosphere does. In the case of the heliosphere, this stream ing is caused by the motion of the Sun through interstellar space at a velocity of about 20 kilometers per second (12 miles per second) with respect to the surrounding interstellar gas. Looking down on the aurorae. 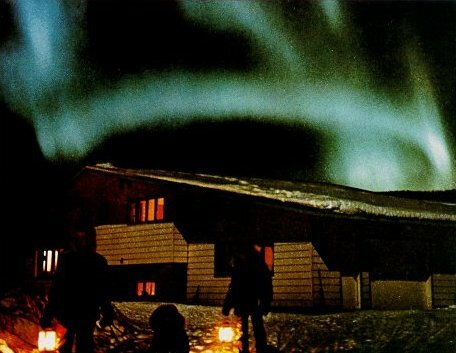 The entire oval of aurorae around the south geomagnetic pole of the Earth is seen in this photograph made from space on June 15, 1975. Images of this kind show many types of aurorae simultaneously and are used to study the difference between "dayside" aurorae (near the top of this picture) and "nightside" aurorae (at the bottom). The distance to the edge of the heliosphere is unknown, because no spacecraft has yet gone far enough. However, we do know that the heliosphere extends at least as far out as the orbit of the planet Uranus - almost 3 billion kilometers (1.9 billion miles) away -, because the outward bound Pioneer 10 spacecraft passed Uranus' orbit in September 1979, and has still not found the boundary.